The global processor market is set to rise by 24% in 2013 due to strong smartphone and tablet sales. 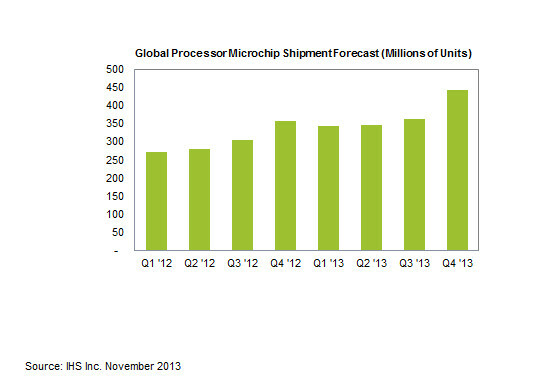 A report by IHS Inc forecasts that processor shipments should reach 1.5 billion units by the end of 2013. H1/13 yielded 24% growth in Q1 on an annual basis and 24% in Q2. Growth projections for Q3 has been placed at 19% while forecasts for Q4 show 24% growth. Analysts at IHS attribute a significant portion of this numbers to smartphones and tablets which have driven large volumes for processor shipments in 2013. Low-cost tablets have played a big part in the rise of processor shipments with 54.5 million units shipped in Q2/13 compared to 38 million in Q2/12 which is equivalent to 40% growth. Processor shipments for smartphones were up 38% from 147.9 million to 204.2 million. Chinese processor vendors such as Allwinner and Rockchip have benefited from increase in demand created by low-cost tablets made in China. The vendors played significant roles not only in the undifferentiated white-box tablet market but also in top-tier levels as they sold to major brands like Hewlett-Packard and Lenovo. Performance of processors remains a key feature in smartphones leading to fierce competition among brands. For instance, a series of flagship smartphones like the HTC One and the Samsung Galaxy S4 were released in Q2/12, including high-level implementations for standalone application processors. Of the four major segments in which processors are used, the PC category was the lone area in which chip shipments every quarter so far this year were generally down from the same periods in 2012. In Q2/13, for instance, processor shipments for PCs amounted to 84.3 million units, down from 89.9 million in Q2/12.